As with most things in life if you have fun with it you can never fail. With all of these recipes you can eliminate, add or change the amount of the ingredients. Playing with recipes and cooking can be a great way to try new foods as well as introducing your children to the wonders of eating healthy. If there are any questions about the recipes you find here or if you find any mistakes of any kind please feel free to contact me and I will reply with as much information as I can. ENJOY. I think this might work the best and thank you to my good friend Maryellen for suggesting it to me. A mutual acquaintance who has a great Irish website sets her recipes up this way. Thanks to Catherine from Donegal too. In my opinion one of the worst things being sold in groceries stores is dinners in a box. If you read the box for ingredients and nutrition facts pronouncing the chemicals included in this stuff not only requires a degree in chemical science but would make you sick just thinking about it. There is nothing you can buy in a box that can not be made from scratch and is easy, inexpensive and tastes so much better as you will see below. Give it a try you will be very surprised. Crock Pot Chocolate Lava Cake another great recipe that is fast and easy and yummy. Put it in late in the afternoon and it is ready for desert with no muss or fuss. I recently put this together at home and took uncooked to a meeting. It came out great and was a hit with everyone. When transporting just make sure the crockpot is level. Crock Pot Old Fashioned Rice Pudding I found this recipe from Food.com where there are hundreds of crock pot recipes. I have another rice pudding recipe on this page made on the stove from left over rice which is really good too. This one takes about 2 to 2 ½ hours so you can put it on mid afternoon and have a nice warm desert after dinner, take it to your childs school for show and tell or to work for parties. I made this the other day and used the original recipe which called for ⅓ cup butter. It was too greasy so I cut it down to 2 tablespoons or you can leave out the butter all together. Let your children help you so they can learn to cook. Enjoy. Fresh Strawberry Muffins My mom shared this recipe on Facebook and I just had to share here. If strawberries are not a fruit you or someone you love can eat other fruits can be used. These are great for a special brunch or occasion. Blueberry Cheesecake In A Jar are easy to make ahead of time, take with you anywhere and fun to eat. They make a great gift for a friend who needs a pick me up or a get well wish and can even be taken to work. Mini Oatmeal Creme Pies are little bundles of creamy yummy goodness. Made fresh from ingredients most of us have on hand. Give them a try and you will have your family begging for more. This recipe came to me from a friend on Facebook. It doesn't have it's own page since the directions are short and easy to follow. Peel potato and cut almost all the way through. Drizzle with olive oil or your favorite oil, melted butter, sprinkle with salt of your choice and pepper. Bake at 425 degrees for 40 minutes. Warm Roasted Nuts on a cold winters day are some of the best snacks to munch on and are also extremely healthy. This recipe is quick, easy and can be made sweet, spicy or plan depending on your personal tastes. Home Made Shake N Bake with less preservatives, sodium easy to make ahead and store for a quick change of pace dinner. Can be used for chicken, fish or pork. Double or triple the batch and store in a sealed dry container in your pantry. Home made Stuffing Mix made from left over bread products, muffins etc. This is great to use for stuffing any time of the year or for the perfect Holiday meal. This is six months of old bread I saved in the freezer. 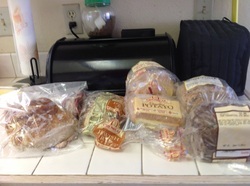 There is Potato Bread, Jewish Rye, Whole Wheat Nut, and Another Nut Bread as well as a Cheese Bread. Chicken Pot Pie on a Shoestring is my version of an old favorite. Most of the ingredients are from the pantry, the chicken is fresh and the dough is from the freezer. 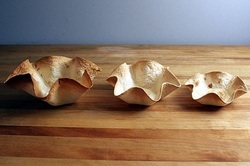 The pot pie costs approximately $6 and will feed a family of four. Whenever you have a whole chicken or turkey that has bones or if you want to make your own beef broth here is how I do it easy and inexpensively. 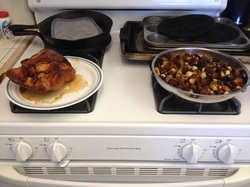 Who doesn't love Thanksgiving Dinner with Turkey, Stuffing and Gravy. 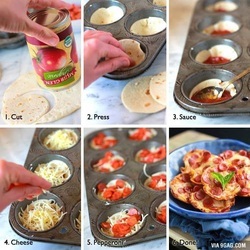 Well here is a great way to make a quick easy Thanksgiving Dinner any time of the year. Click on the words Thanksgiving Dinner and find out how easy it is to make this dinner quickly and easily. 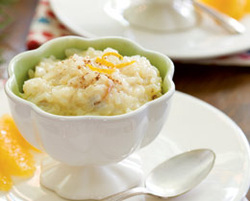 A quick and easy fresh recipe for Stove Top Rice Pudding made from either left over rice or you can make a batch of rice ahead of time let it cool and then make the rice. Just remember to not add salt and pepper to rice while cooking. For those of us who love brownie type cake but can not eat chocolate due to migraine trigger or other issues these are the answer Lemony Lemon Brownies. I love my crockpot and I have two a large one for big dinners and a small one for just my husband and I. This recipe for Teriyaki Beef and Broccoli is great and the Teriyaki sauce can be made on the stove to use with left over chicken or other dishes. Bacon Wrapped Pork Chops or pork loin steaks is easier than you think and oh so good either cooked in the oven, on top of the stove or on the grill. Serve with any of your favorite sides to make a simple meal for a group or a special meal for any occasion. Chocolate Covered anything is good on so many levels but for some the image of making this treat is not only daunting, scary and expensive but out of the realm of reality time wise. This need not be true. For those who want to make this treat with their children on a tight cost and time budget here is a great way to cover any type of fruit in chocolate or caramel and other added toppings. This is my all time favorite thing to eat well actually it is a close call next to tuna sandwiches and tomato soup. When I have a migraine this seems to be the one thing I can eat that makes me feel better and actually helps the pain go away. I call it Baked Macaroni but my middle son Shane calls it Baked Tomato Mac. You can make as much or as little as you want, add things to it like ham, ground beef, chicken, salsa or just plain like I love it. It makes a great left over for lunch, as a side dish or just by itself. It is very KID friendly and cheap to make.